my moms mom only had one sister, juanita. aka mimi. that was probably all she needed. my grandma was a smart tough woman, and my aunt was maybe a little tougher. its not surprising that she spent her life in the steel city. she had little tolerance for bs – and less so as she got older. when the clock turned 90 on her she started doing interesting things like sending me back letters i wrote her when i was a kid. at first i was all, what the heck? but when id talk to her on the phone id understand: she knew this day would come. and she knew id probably get more out of it than the garbage man. aunt mimi and uncle bill were huge steeler and pirate fans. they were right there during the we are family world serieses and the steel curtain super bowls. somehow they got the autographs from lots of the players and sent them to me. and she hung in there kicking till 96. 20 years ago, after uncle bill died, she got a portrait taken of herself. then sent it to my mom. my mom was all, ooooooo kaaaaaaay. oh my god, Aunt Mimi totally took a selfie 20 years before it was cool. glad youre reunited with uncle bill! hope he’s still eating raw hot dogs! had lunch in beverly hills while talking to some very nice people, one of whom knew Daily Nexus legend Steve Elzer. then i got to go to a free movie preview. they said it was the first time any audience has seen it. i love going to those things. i hate knowing things about movies when they come out. he just wanted people to read it and not judge it on anything else other than the words inside. i feel that way about movies. fine tell me who’s in it if you want, but i dont care. just be good. tonights was good. different. after they asked what movie did it remind you of. You know, this will sound weird, but i think you had a little bit of influence on my decision to move here. My first contact with the idea of [this town] was through busblog. The way you wrote about it made it sound so lovely. When it came across my desk as a grad school option, I definitely took that into account. So thank you, internet stranger from my youth. let alone a pretty serious life decision. Hey Tony, Can I ask a favor? I’m old school, I don’t like much new music. And wouldn’t know where to find new stuff if I did. But I now have the need to find some “love” songs, if you can dig it. I like that Preatures song you mentioned tonight. Can you suggest a few more? I’d like something authentic with a little guitar involved somewhere. Something that speaks from the heart. Everything I look for goes back a couple decades. Thank you very much. they may seem gloomy at first but the lyrics are soooo romantical and dreamy. she may not have the most amazing vocal range, or guitar youre looking for but many of the songs are about love. and shes rad. the last woman i turned this on for later said i never played any good music for her. i believe she forgot about this one. made it up the big hill with no issues. no idea why, maybe from hiking last week? who knows. maybe it helped that it was a little chilly and not super warm? i didnt have the nerve to take him up on it. saw this sign and though, wait isnt $3,398 the price of a Chinatown apartment in NYC with a fraction of that square footage? Sunday the San Diego St. baseball team had a costume party. i didn’t see your girl Danielle in the crowd but something tells me she was there. and then she ran over to Sea World to yell Blackfish Blackfish! Blackfish! this makes me very happy because i have fantastic references: a former boss, two former employees, a former coworker, and the pope. problem is new pope loves everyone. if i was cocky i woulda gotten old pope. but it’s bad enough im blogging this. some may say its a jinx. but even mean pope would tell you you cant jinx anything. the worst jinx is you. talking. saying anything. we love pets because they cant say the wrong things. people think thats the lesson, but its snot. even the guys who invented twitter play it safe and hardly ever tweet. they no better. but let me tell you about a place called las vegas. which many people consider the most fun place in america. in las vegas theres currently seven Cirque Du Soleil shows happening: Love at the Mirage, O at the Bellagio, Zarkana at the Aria, Michael Jackson’s One at Mandalay Bay, Mystere at Treasure Island, KA at MGM, and Zumanity at New York New York. technically the most dangerous thing you can do to yourself is walk down the street. you’re way safer, way less likely to “jinx” yourself if you just stay in the house and watch tv. but people love Cirque Du Soleil because it’s the opposite of that in beautiful ways. not only are these people out of their house and walking around, but theyre walking on ropes, theyre walking on peoples heads, people are walking on their heads, theyre jumping theyre climbing, and theyre doing it in the most graceful wonderful ways you could imagine. basically showing us all that our daily journey not only could be a ballet: but probably is. go forth and rock, saints. live lives of beauty and courage. 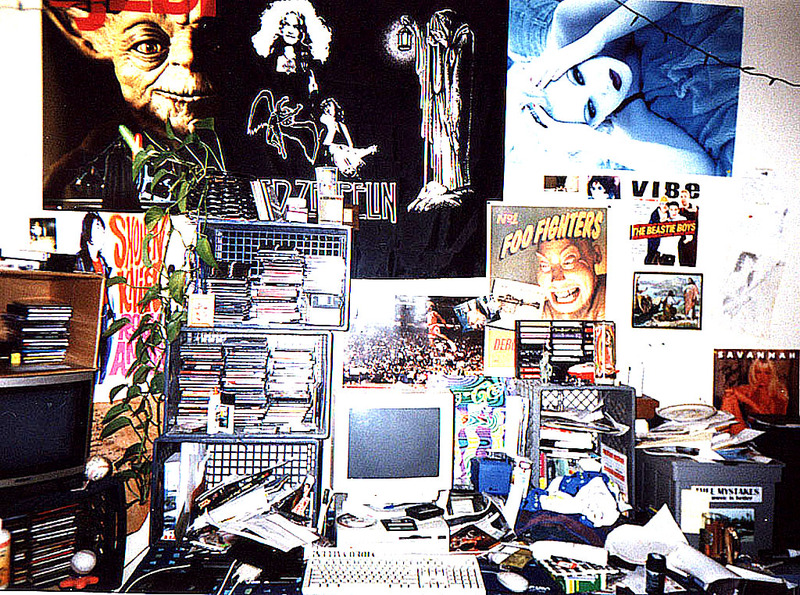 this was my room at 591 Haight Street in San Francisco in 1995.
that white Mac in the center was the first device that ever gave me “high speed” Internet accessibility. but we could also receive a phone call simultaneously. which was a big deal when you shared a house with 5 other dudes. the ISDN hardly worked. which was ok because the web in 1995 was so tiny and insignificant that even Wired didn’t wanna put their full name on their website, instead they made Hot Wired to distance themselves from whatever the hell the WWW was in its infancy. little did we know that the Internet had already been around nearly 30 years (thanks to the help of UCSB). albeit way more boring. but dudes were exchanging files so technically the web was on. as “journalists” all of us in our Haight House marveled over the fact that we could be instant publishers. in color. for free. with a potentially unlimited audience. before the web the closest one could get was either a Zine or an English Newspaper in Prague. but the downfall was, if everyone bought up all of the copies of that issue, that was it. the end. but online: if you had the proper servers, you could reach millions of readers overnight, and barely notice. that excited me. unlimited success. unparalleled opportunities for creativity. the blankest canvas ever with free admission to anyone with a connection. and back then, back when the wild west was truly wild, and you had very little competition, and if you had been somewhat trained in the art of written communication: it was probably the same feeling chuck berry felt when someone handed him an electric guitar. or the same feeling eddie van halen got when he stepped on his first pedal. before the Internet, loneliness was a concept i could occasionally relate to. nowadays the amount of 24/7 love and attention and options and opportunities to connect and learn overfloweth. can’t wait to see what the next 44 years will be like. and Plan De Fuga’s “Your Side”. i just rocked the blah blah blah bladdity blah. or hold up a 3×5 card or something.